Riding the wave of rimless, low-iron glass aquariums popularity, Reef Octopus has decided to join the game. 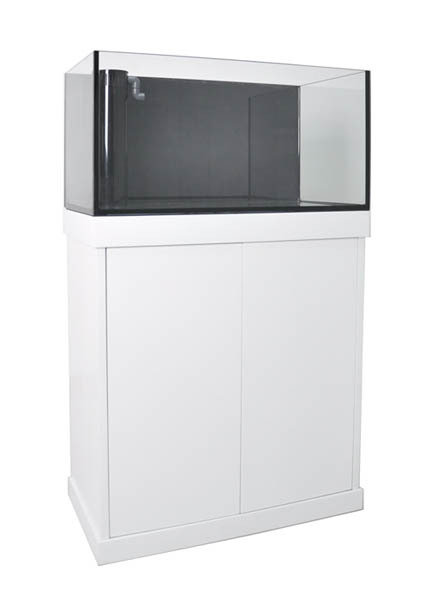 Their new line of aquariums are designed to become “the center of attraction in your home.” The low-iron glass is accented by black ShineEust glue joints and a unique and small overflow system. The sleek stands are made of MDF, and E1 grade environmentally-friendly material, and should take about a half an hour to assemble. Currently, there are two models of Luxury Aquariums and Stands from Reef Octopus, the LUX-T60, 32 Gallon Luxury Aquarium (23.6″ x 17.7″ x 17.7″) and the LUX-T90, 48 Gallon Luxury Aquarium (35.4″ x 17.7″ x 17.7″). Both are offered with an optional sump. Below is the information directly from the CoralVue website. Luxurious Reef Octopus Aquarium systems can easily become the center of attraction in your home. These well made show tanks features stunningly clear low iron glass, sleak black ShinEust glue joints and all quality build to be dependable. Pre Drilled hole on the bottom of the tank to for the use of the Black tube Water Flow system.The stand/cabinet is made of MDF( Medium Density Fiberboard), an E1 grade environmentally friendly material. Very easy to be assembled and will only take about a half an hour. Just follow the manual for assembly! A good reef sump is very important to an Aquarium system, many devices are set up in it, and it also enlarge the amount of water in the system, makes the system much stable. There also have several parts with the sumps, FB-200 filter bag hang on devices and a Multi-purpose probe fixation device. They will help a lot on fixing the overflow pipe and probe like PH probe. returning pipe and another for the water over flow to the sump. useful when added a calcium reactor or adjust a new finish to the tank. the inner of the tank much succinct and have more space to put reefs. It is also silent, we added a small silencer on the overflow pipe. A smart silencer, reduce the noise of the water drop.